Hey everybody, Roberto has noticed me on the other forum. Mattogno may console himself in that he's not the only one to have panicked, though the poor fellow who calls himself Drew J and is rambling away to his fellow true believers' silent embarrassment on the Cesspit may also be driven by the ambition of making himself a name in "Revisionist" cloud-cuckoo-land. I understand you still post on the Cesspit, Mr. Heink, so here's a request: Would you please inform this Drew J fellow that I'm not allowed to post on the Cesspit and invite him on my behalf to post his "wisdom" on the RODOH forum, where I'll be glad to slap it around his ears in my spare time? Thanks! If Muehlenkamp was really reading my posts, he would see that I have said I am doing this for my own benefit so that I can learn about Belzec as I have barely looked into it before. Reading through and summarizing and responding is how I am learning about this camp and what has been said about it. I have done this for me. Muehlenkamp also should keep in mind that the texts in red were little points I granted to him and I have already admitted some shortcomings in Mattogno's Belzec book and that I wouldn't spend money on it. I am not totally against Muehlenkamp on little technical victories he has obviously won (red text) so I don't know what the hell he would have to talk about. Well probably my view on part one of his essay for sure. That being said, I have also said that Muehlenkamp is burying his head in the sand when it comes to other things (blue text), like how Mattogno was right (but for wrong reasons) about the plan of the camp memorial and how there in fact was a plot to cover things up from revisionists. The fact that Jewish religious law about not digging so as to disturb the graves was invoked proves a conspiracy to keep revisionist hands and methods off the camp. Muehlenkamp just can't admit how scientifically absurd it is to demand that we believe something, but then put restrictions on trying to prove it. The people can't afford to have Belzec exposed to the light of day just like Treblinka was. Went over part three again. Skipped ahead a bit from where I left off and Muehlenkamp addresses 484.
is it really an "obvious and incontestable" fact that the drillings in grave # 10 showed the presence of corpses in wax-fat transformation in two small separate parts of the grave? Mattogno claims that, whereas drills 483/XV-30-60 and 485/XV-30-50 in Prof. Kola’s Figure 13 produced "positive" results, i.e. hit human remains, drill 484/XV-30-55, in between those two, was "negative", i.e. no human remains were found in that drill. Actually, if you look more closely at grave # 10/98 in Kola's Figure 13, you see that core sample 484/XV-30-55 also shows the stylized "x" shapes designating "human bones and wax-fat mass" (Mattogno reads the caption in Figure 12 in the sense that the symbol designating human bones and wax-fat mass is a double stylized "x", but this reading is incorrect as it would imply that only the number and assortment of dots shown in square preceding the symbol for "human bones and wax-fat mass", and not any other number or assortment of dots, means "burned human bones"), and it mentions a "canine tooth" and a "blockade". The "blockade" in sample 484/XV-30-55, although this is not expressly mentioned as it is in sample 486/XV-25-50, is probably also a spot where the drill couldn't go further because of bodies in wax-fat transformation, as such blockades were encountered at various depths of grave # 10 according to the grave's description ("The grave was very deep (the drills in particular places were stopped at the depth of 4,25 to 5,20 m, because of bodies in wax-fat transformation and underground waters presence."). Should Mattogno want to argue that the blockade of sample 484/XV-30-55 is due to underground waters, he should bear in mind that this is unlikely because the adjacent drills came upon bodies in wax-fat transformation at a greater depth and only 485/XV-30-50 touched ground water (after passing at least two layers of bodies in wax-fat transformation). An omission of the mention "human corpses" behind "blockade" in sample 484/XV-30-55 is more probable. So what have we learned from above? That seeing an X is an indication of human corpses according to the legend on kola figure 12. And that these X's show up not only in 483 and 486 which are labeled as having human corpses, but that X's appear in 484 right at the blockade. At least it sure looks that way when I look at it. But we have to ask ourselves, why didn't Kola label this is a human corpse blockade if he was so sure? Did you know that Muehlenkamp isn't even sure? Look at his word choice again. And what justifies his leap of faith? So because drills were sunk near 484 which found human remains (allegedly since Kola never really documented it with video or photo), then 484 must have a human remain blockade. Well as I said earlier, if lower sunk drills around 484 such as 483 and 486 took longer to hit human remains, and 484 is so close by, then why are they all not having corpses at the same level? Muehlenkamp basically admitted that there is no proof that 484 hit a human remain blockade. He said probably and be based it not on actual physical evidence, and not even on kola's work, but just on his own intuition. That's not science. On the other hand, if those are indeed X's in 484 as Muehlenkamp said, but 484 is not labeled as having human corpses when kola easily could have done so, then maybe Muehlenkamp is telling us that Kola's 484 sample hit a blockade and KOLA HIMSELF, having written in those X's, just assumed it was a human corpse blockade. So perhaps I was wrong and Muehlenkamp is simply putting into words what Kola artistically depicted about an assumption regarding sample 484. Either way, there is no proof that 484 hit a human corpse blockade. Kola never labeled it as such as Muehlenkamp admitted it only probably is. However, the fellow doesn't seem inclined to accept my invitation to debate on RODOH, preferring to hide behind the lame excuse that his garbage is meant "for my own benefit so that I can learn about Belzec as I have barely looked into it before". Another "Revisionist" chicken. Never mind. I'll have fun with Drew J's tirades after I'm finished with guru Charlie. So by investigating and posting my findings and opinions on Muehlenkamp's article, I'm an attention whore. When Muehlenkamp refutes Mattogno (which in my opinion he has in the places I have turned into red text), he is not being an attention whore. Secondly, if Muehlenkamp really were to take note of my 'babblings' he would acknowledge that I have acknowledged his victories in the red text. But Muehlenkamp doesn't though he has had ample opportunity. I find it strange. I find it strange he could consider my acknowledgements of his victories over Mattogno (noted by red text) as babblings. I find it strange Muehlenkamp would shoot himself in the foot like that. Muehlenkamp has responded to my response. So I will in turn reply to him. My words are italicized. Muehlenkamp's are not. However, designating the camp entirely as a memorial, means that digging would have been done not to disturb corpses according to the gas chamber mongers. Right? Wrong. It meant that the areas containing human remains would have to be identified before starting work on the memorial in order to avoid digging them up during the memorial's construction. Of course digging up human remains could only be avoided if the archaeological method used to identify the mass graves was one that avoided digging up human remains. That's why Prof. Kola's method of core drilling was chosen. The method obviously satisfied the religious concerns of rabbis Schudrich and Schlesinger, though it drew fire from an American rabbi, Avi Weiss. So it wasn't to document atrocities, it was to find out where the bodies were so that construction of the memorial would not disturb them? Okay that seems fair. However you can't avoid the implications of what such a dig involves. Once you start digging and documenting, you are in effect going to prove (or disprove) a mass program of genocide. There was an undercurrent of trying to prove their case simply by virtue of them doing all that digging. Even if they didn't really intend to, it's what they ended up doing. Okay, so would that not mean that if they didn't want to disturb corpses and do a lot of digging, doesn't that mean there was a conspiracy to prevent revisionists from checking things out by declaring the whole camp too sacred to touch? No, turning something into a memorial is not meant to keep anyone from "checking things", be it at Belzec or anywhere else. And if anyone was meant by the memorial's configuration to be barred access to the graves, it is robbery diggers that have been disturbing these graves for decades as they searched for valuables supposedly buried with the murdered victims. It's not a conspiracy to just engage in core sampling because they were going to build a memorial and how can a memorial cover anything up if the goal is to remind people, being that it's a memorial. This is essentially the reply of Muehlenkamp. I guess I can't disagree with that. Certainly not if core samples in fact did turn up human remains. For if they did and it was an effective method of documentation and was known to be BEFORE the core sampling started, would that not show that there wasn't an attempt to cover it up? And hence shouldn't anyone, myself included, REVISE our previous position about an attempt to cover up the camp and prevent a real investigation since core sampling (most likely a reliable method of documentation) was done with the honest intent to find bodies? Second of all I'm not familiar with past grave robbing attempts. Thirdly, who would be so stupid as to think that a bunch of Jews who had their property taken away from them by the nazis would be allowed to have it with them in the camps? Kola's investigations had some photos of things found in the camp and NOTHING valuable was found. the mass murder at Belzec has long been proven by documentary and demographic evidence and the depositions of accused perpetrators and eyewitnesses before courts of the Federal German constitutional state. I wonder how many things were tortued out of Germans like they were with regard to Hoess for example who confessed to a camp that we know now didn't even exist. But of course that's just a perpetrator example and you listed many classes including eyewitnesses such as Reder. One thing I could not discount was how his map, when rotated properly was VERY SIMILAR to what Kola's core samples are said to have contained. Of course people could argue that Kola simply made things up but that would be hard to actually prove. What I want to see are photos of actual core samples and scientific, laboratory proof of the human remains. I've taken archaeology courses before and seen how archaeologists don't just write about what they find. They document it with photos and lab analyses, DNA analyses, etc. So why wasn't that done by Kola? What, if anything, is he hiding from me (and others)? And nobody changed their minds about Prof. Kola's digging in the mass graves; he was not allowed to dig there but restricted to core drilling, period. He was only allowed to dig in areas containing traces of buildings that he came across during his investigation, and this was obviously so because his digging was a) not expected to come upon and disturb human remains in these areas and b) expected to turn up information of archaeological and historical interest about the structure and features of the camp. And why? Jewish religious law. You know some people may look at that like someone trying to claim freedom of religion by confessing to a priest and then trying to have that thrown out in court. 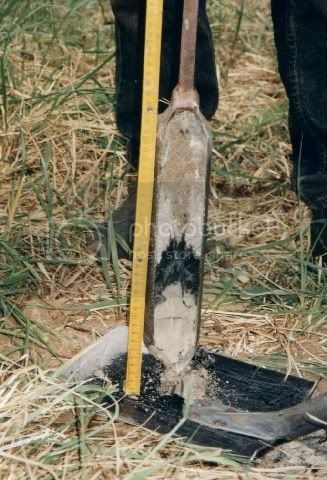 Despite this being a proper reaction at the outset, one must keep in mind that you can't stop there and you have to consider whether or not the core drill procedure (a reliable method of documentation of whatever is below the soil) in fact proved what a mass digging would have ended up proving anyway. It reminds me of some legal phrase I have heard before called "INEVITABLE DISCOVERY." Interesting similarity there but let's move on. I guess our friend is claiming that "they" started out digging but then turned to core drilling because they feared that digging would reveal physical evidence in amounts incompatible with mass extermination. Actually core drilling rather than digging was the policy from start to finish in the areas containing human remains, and what physical evidence it turned up fully corroborates the record of mass murder according to other sources of evidence, as I demonstrated in section 4.1 of my original article and again in section 4.1 of my riposte. 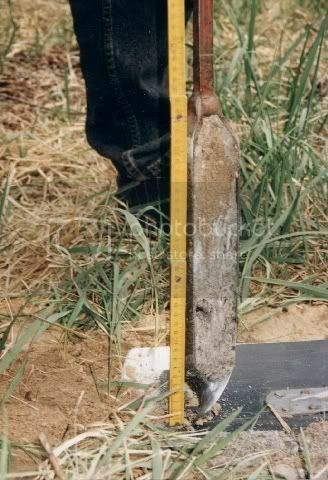 the fact that Prof. Kola was eventually allowed to dig at the locations of former camp buildings (where he wasn't expected to come upon human remains) doesn't change the fact that Prof. Kola was only allowed to drill but not to dig in areas where he was expected to come upon human remains, namely the areas containing the mass graves. So core sampling to find human remains and mass graves was the policy from the start. However digging was only restricted where it was certain that there would be no human remains and assistance in this matter would come from what Reder told the world. This doesn't validate Mattogno's conjectures and insinuations, however. For independently of whether identifying the mass grave areas was Prof. Kola's only task or he was eventually also commissioned to attempt an archaeological reconstruction of the camp's buildings, the archaeologist was bound by his employers' religiously motivated concerns about disturbing the dead to keep physical contact with human remains to the minimum indispensable for identifying the areas containing such remains, as I pointed out in Part 1 of the original blog. To put this in such a way that even Drew J can understand it, the fact that Prof. Kola was eventually allowed to dig at the locations of former camp buildings (where he wasn't expected to come upon human remains) doesn't change the fact that Prof. Kola was only allowed to drill but not to dig in areas where he was expected to come upon human remains, namely the areas containing the mass graves. It seems like Muehlenkamp is correct and has cleared up a misunderstanding I had previously. I wonder if Mattogno realizes this or would even admit it. That's his first post to me. Many others follow. Last edited by Drew J on Mon Sep 14, 2009 11:08 pm, edited 1 time in total. In conclusion, we can see that the location given by Kola for the majority of the graves is in disagreement both with Rudolf Reder's testimony and with the findings of the Polish investigative commission. No, we can say that Prof. Kola found the smaller part of the graves in an area where the Polish investigators excavated a similar number of graves, that the total number of graves he found is similar to Reder's, and that the same applies as concerns the geographical distribution between the majority of the graves (north-west area) and the smaller part thereof (east-northeast area). Your desperate attempt at splitting hair is duly noted. On top of this dishonest changing of the subject, Mattogno has the cheek of calling me dishonest for not having addressed in this context (i.e. in discussing his claims about diverging mass grave locations on various maps) the exaggeration of Reder's claims as concerns the mass graves' size. Why I should have bothered with size when discussing his claim regarding location he doesn't explain. First you quote Mattogno saying that Kola's location for mass graves doesn't jive with Reder's testimony or the Polish investigators. That's claim two of his. But you say that because Mattogno also talked about size and capacity of the graves (claim one) BEFORE he got on to the location, that he is a self contradicting fool? No, I'm pointing out that size and capacity are not the subject of my commentary but only location is, and that Mattogno's babbling about size and capacity in this context is therefore off topic. Sorry Roberto but this argument does not fly. One can talk about the size of graves being mistaken, AND one can ALSO claim that the location is ALSO mistaken. Two completely different statements that don't logically contradict each other. They are simply different and distinct. So in other words, we have Mattogno saying that the size capacity as stated by the holocaust believers crowd is wrong, and he is also saying that the location of the graves, as believed by them, is wrong. Nothing contradictory here. Therefore, he's allowed to talk about more than one aspect of Belzec. He's allowed to 'change the subject' because the 'subject' isn't really being changed. The subject is the graves. He is staying on the subject and is questioning more than one aspect of this single subject. You don't get it, do you? My argument in connection with Reder's testimony was about location, not about size and capacity. And so was Mattogno's argument that I had referred to in my original article. Therefore Mattogno should stick with location in this context. We can and will talk a lot about size and capacity later, but in this particular context they are off topic. Okay, so what is being said is that Mattogno in order to disprove Kola-Muehlenkamp, moved the goalpost. Instead of talking about locations, he moved on to size and capacity. Now my point was that those are viable topics and are allowed to be discussed. However Muehlenkamp's essential reply that this subject and any possible refutations about the size and capacity Mattogno could come up with DOES NOT constitute a refutation about supposed contradictions between two people about the location of the graves. That is correct of Muehlenkamp to say and his point is now taken fully by me. Looks like Muehlenkamp gets another one. In response to me granting an overlap between Kola's depictions and the Bau-Reder map, Muehlenkamp said, "Better save your breath, pal. I don't feel flattered by your concessions (though they make you come across as less dishonest and hysterical than guru Mattogno himself), and your fellows in faith may resent them." To that I say, fair enough. Further down, we find more concessions by me to the Muehlenkamp side of things in that the kola depictions agree with the Bau-Reder map, the polish commission, and the O Niel map. We also get into a discussion about holocaust-history.org's take on Kola and Belzec. Of 4.16.13, " none of the mounds numbered 1 through 6 coincide with site Kola identified as containing ashes and charcoal." However, 4.16.14 has some blue overlay added on that have letters to them instead of numbers and they represent disturbed soils according to the map legend. The areas, annotated A through D have been added to the overlay, where Kola found disturbed soils, but found neither human remains or charcoal. It is immediately apparent that there are six roughly equally spaced sites of disturbed soil or where ashes were present 25 to 30 meters apart ( A through D plus the two grave sites) along this northern camp boundary. All are in the same size range - about 25 meters long - the exception being site D whose full size being unknown since Kola coring ceased in that place. However, the region in which bright new soils brought up by excavation extends another 25 to 30 meters further east. The even spacing and uniform sizes suggests that each site of disturbed soil is a grave, and that the lettered sites were those emptied of bodies for burning and whose the ashes were reburied elsewhere. A, B and C are similar in size but D is much smaller. Of course because Kola stopped drilling there. As well B, C and D are seperated from each other by similar lengths, while A is considerably farther away from that cluster. Hardly uniform. As I said earlier, "disturbed soils lettered A, B, C and D on the page had no human remains, there are two plots inbetween A and B which do according to Kola. Look at 4.6.14 to see what I mean and follow that map legend to see it. So therefore what now?" To which Muehlenkamp answered. Black areas with red border = fat-wax transition remains & lime found by Prof. Kola. Areas labeled 1 to 6 = Even-spaced areas regarding which Prof. Kola reported no disturbed soils and/or human remains, but the even spacing and uniform sizes of which suggest mass graves not identified by Prof. Kola, in Bay's opinion. The question is not why the Nazis would bury the cremation remains of bodies from a given pit somewhere else, but rather why they would necessarily return the cremation remains of bodies from a given pit to the very pit from which those bodies had been extracted. It's likelier that they just dumped cremation remains into the pits closest to the places where the bodies were cremated and larger cremation remains were crushed. Apart from being easier, that made for better concealment. The fewer the pits filled with cremation remains, the harder it would be for Soviet or Polish investigators to find these remains. Makes sense. Remove bodies, cremate them, and then put them in a place close to where the initial cremating was done. It's a short moving distance method to make up for the long distance moving method of removing the bodies in the first place. Very smart, strategically speaking. Ashes can be found and could be found back in the 1940s, for sure. But it's one thing to find ashes and another to find whole bodies. The latter are easier to quantify, which means that the extent of the killing can be established with a fair degree of accuracy based on the physical evidence. Where only cremation remains are found, on the other hand, establishing the number of victims is rather difficult. The SS couldn't reasonably expect to hide the fact that they had committed mass murder. But they could reasonably expect to conceal the extent of it. Actually no bodies in A, B, C and D doesn't mean a thing, as the areas labeled 1 to 6 by Bay don't overlap with A, B, C and D but are in between them, and the same applies to the areas where Prof. Kola found corpses and/or cremation remains. But even if the areas labeled 1 to 6 overlapped with A, B, C and D, this would not rule out the hypothesis that bodies were originally buried in these areas and the cremation remains of these bodies were eventually dumped somewhere else. To recap, "none of the mounds numbered 1 through 6 coincide with site Kola identified as containing ashes and charcoal." Not only that but let's remind ourselves what these numbered soil mounds are. These are the spoil heaps left after removing the top layer of soil from the graves during the process of opening them. In the left hand image of the figure, mounds 5 and 6 are easy to discriminate, as the sun highlights the southeastern sides. In the three dimensional model, one can detect 4 additional mounds (1,2,3 and 4). For the sake of clarity, the right hand image has been retouched to show what is normally only visible in stereo. How do we get from mounds 1 to 6 being " spoil heaps left after removing the top layer of soil from the graves during the process of opening them" to them being "mass graves" due to "even spacing and uniform sizes"? I don't see how that leap can possibly be made. If these mounds are just top soil that was put there by diggers, then maybe their uniformity doesn't prove them as once holding bodies, but perhaps that the diggers disposed of their dirt in a uniform fashion as they searched for evidence of extermination. Finally, if areas 1 to 6 have no disturbed soils or human remains, then how can they be current or even former mass graves? How did the extermination theorists justify this leap? Further down, Muehlenkamp in responding to some questions of mine, implies that 1 to 6 mounds did have human remains. Look at this partial exchange. Correction: with gasoline engines in fixed gas chambers. Correction: From the even-spaced and uniformly shaped areas labeled 1 to 6 on Bay's overlay. burning the dug up bodies and putting the ash somewhere else. Say somewhere in the northwest or northeast since allegedly kola found ash in some of those places too? Not allegedly, but actually. Prof. Kola found 33 pits containing human remains, thereof roughly two thirds in the northwest area and one third in the east-northeast area of the camp. Ten of these pits also contained corpses in wax-fat transformation at the bottom. So the mounds 1 to 6 that have no disturbed soils or human remains in them and are just top soil that comes from grave exhuming, are magically converted into former graves simply because of their uniform arrangement. It couldn't possibly be that the top soil from other graves was disposed of and settled down in other areas uniformly by the diggers themselves. Perish the thought. in regard to these areas their even spacing and uniform sized/shaped, pointed out by Bay, requires an explanation that I don't think "Revisionists" are able to provide. What, if not mass graves, could those evenly spaced and uniformly sized/shaped possibly have been? I think I just gave an answer. there was no human remains in any of the "graves." You say that there was "grave exhuming." Notice how the story keeps changing. Didn't Kola say that all he did was core sampling? Last edited by Pepper on Tue Sep 15, 2009 10:04 am, edited 1 time in total. Bay is a fraud, just like Kola and all the rest. Why are you playing the shell game with the hoaxers? They're laughing at you Drew. Because I actually want to read the other side and take time to understand them. I may have been a bit hasty with some of my replies on this topic so I'm trying to be more calm about it. In rules of debate, saying Bay is a fraud is one thing but proving it is another. However, I have done that with regard to his claim about mounds 1 to 6. By combining quotes from other sources, I have shown that mounds 1 to 6 are irrelevant because it is admitted they are not disturbed soils and they certainly have no human remains. So as to why the extermination theorists focus on them at all, is unjustified. Muehlenkamp and Kola would disagree. If you go back in this thread, you will see that Kola made representative diagrams of the core samples. Also he claimed that decomposing bodies and wax fat also acted as blockades that prevented the drill from going down further in some places. Others have made the quibble that what was sampled in the cores wasn't properly photographed, videotaped. Muehlenkamp replied that you don't have to do that in archaeology. To which I say that yes you do. Archaeologists take videos and photographs all the time. They even take samples back to the lab to make sure they in fact have human ash or crushed skeletons in their core samples wherever they take them from. Secondly, if archaeologists were into doing nothing more than simply writing down what they found, why did the team at Treblinka use ground penetration radar technology and document their visual findings onto a cd? 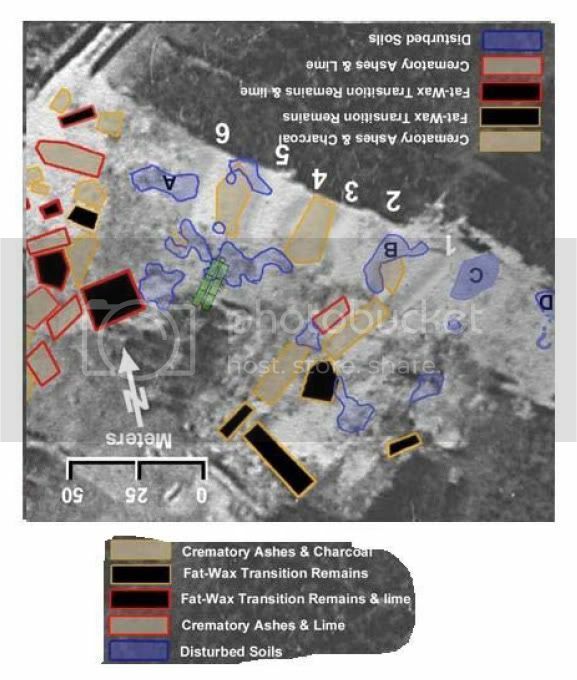 the shyster should try explaining what, other than ashes of human bone and tissue (the grey stuff), wood ashes (the black stuff) and bone ash or lime (the white stuff) the non-soil substances on the core sample photographs shown above could possibly be. Wonder why he's using Sobibor 'evidence' to argue for Belzec? Maybe because the revisionists have a point that no photographs were taken to back up what Kola said? Even Bay was a fraud as already stated and as I apparently showed with respect to at least one issue. Well as Muehlenkamp said, core sampling was done to figure out where the mass graves were so that when digging was to be done, no bodies would be disturbed. So that makes me think that the digging was to look for archaeological evidence of building structures. Muehlenkamp and Kola would disagree. Drew, can you prove that there exists at Belzec a grave with human remains in it? there is some overlap as you can see. It would seem Roberto does have a point here about location similarities and also how kola and his team were able to find graves in places that Reder described if you examine the artistic depictions. [/color] Again, this is all based on the assumption that sufficient drilling and core sampling was done at those places to prove those were mass graves. At this point, I am just seeing whether or not the depictions of Belzec as rendered by Reder and Kola have overlap and similarities and it seems they do. So congrats to Roberto on finding similarities between the two and nothing more. At least for now at this point. Kola may not have been lying about what he found but we also have no photos or video of those core samples. At least they tried to photograph them at Sobibor. I'm not saying Muehlenkamp is right about everything. I'm saying that if I'm going to write him off, it has to be for the right reasons. I've done some googling for Greg Gerdes and I have only found this. What he didn't find was any human remains. If you disagree Drew, please show us the proof that he did. Really Drew? Then please show us the other... what?.. 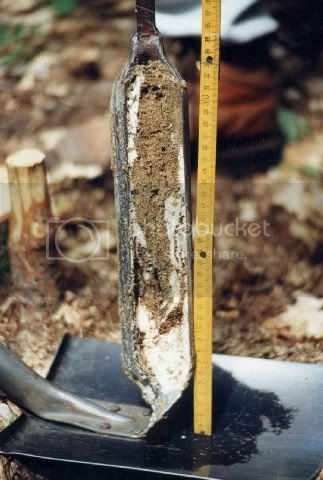 180, if my memory serves me.. other photos of the othe core samples. I'm not saying Muehlenkamp is right about everything. Yes, he is right about one thing. He can't locate / prove the existence of a single grave that contains a single ounce of human remains at any of the Reinhardt camps. I'm saying that if I'm going to write him off, it has to be for the right reasons. His being a cowardly, patholgical liar isn't reason enough Drew?